Download "University of Wisconsin-Stout. Occupational Safety & Health Plan. Overview"
1 University of Wisconsin-Stout Occupational Safety & Health Plan Overview Wisconsin Statutes and Wisconsin Administrative Code (Comm 32.11) require all public employers to develop and implement a safety and health program that describes the procedures, methods, processes and practices used to manage workplace safety and health. The program shall include, but not be limited to, elements for hazard identification and assessment, hazard prevention and control, and information and training. Other parts of Wisconsin Administrative Code, found in Comm 32, detail the right of the Department of Commerce to inspect public workplaces, and list which federal OSHA standards apply to public workplaces in Wisconsin. Included in Comm 32 are requirements for record keeping of workplace injuries and illnesses. 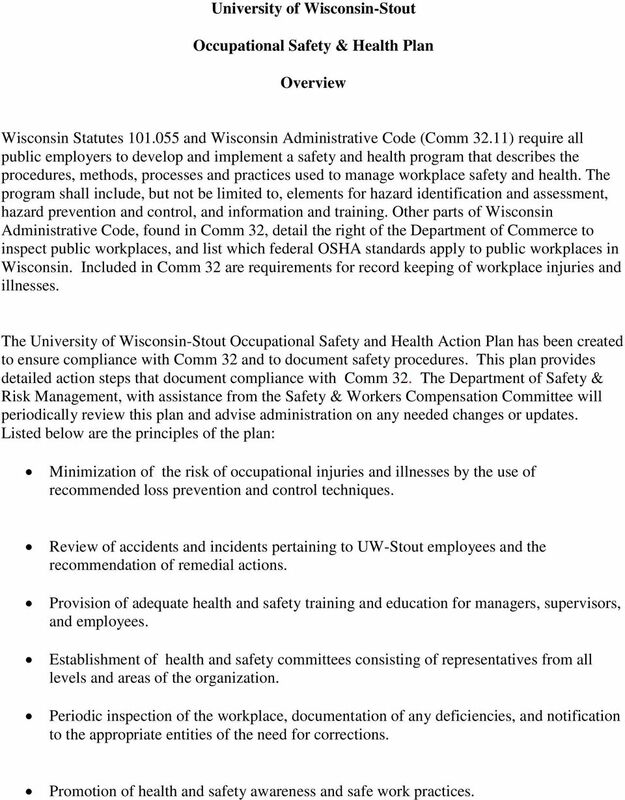 The University of Wisconsin-Stout Occupational Safety and Health Action Plan has been created to ensure compliance with Comm 32 and to document safety procedures. This plan provides detailed action steps that document compliance with Comm 32. The Department of Safety & Risk Management, with assistance from the Safety & Workers Compensation Committee will periodically review this plan and advise administration on any needed changes or updates. Listed below are the principles of the plan: Minimization of the risk of occupational injuries and illnesses by the use of recommended loss prevention and control techniques. Review of accidents and incidents pertaining to UW-Stout employees and the recommendation of remedial actions. Provision of adequate health and safety training and education for managers, supervisors, and employees. Establishment of health and safety committees consisting of representatives from all levels and areas of the organization. Periodic inspection of the workplace, documentation of any deficiencies, and notification to the appropriate entities of the need for corrections. Promotion of health and safety awareness and safe work practices. 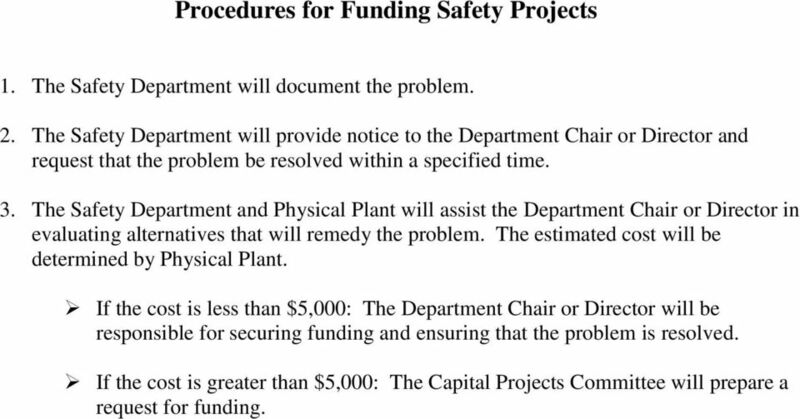 2 Procedures for Funding Safety Projects 1. The Safety Department will document the problem. 2. The Safety Department will provide notice to the Department Chair or Director and request that the problem be resolved within a specified time. 3. The Safety Department and Physical Plant will assist the Department Chair or Director in evaluating alternatives that will remedy the problem. The estimated cost will be determined by Physical Plant. If the cost is less than $5,000: The Department Chair or Director will be responsible for securing funding and ensuring that the problem is resolved. If the cost is greater than $5,000: The Capital Projects Committee will prepare a request for funding. 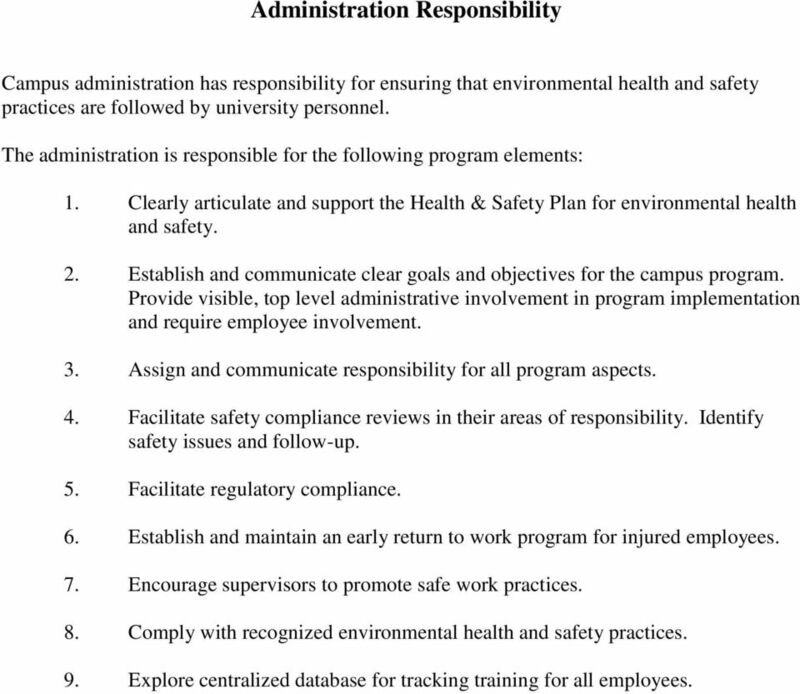 3 Administration Responsibility Campus administration has responsibility for ensuring that environmental health and safety practices are followed by university personnel. The administration is responsible for the following program elements: 1. Clearly articulate and support the Health & Safety Plan for environmental health and safety. 2. Establish and communicate clear goals and objectives for the campus program. Provide visible, top level administrative involvement in program implementation and require employee involvement. 3. Assign and communicate responsibility for all program aspects. 4. Facilitate safety compliance reviews in their areas of responsibility. Identify safety issues and follow-up. 5. Facilitate regulatory compliance. 6. Establish and maintain an early return to work program for injured employees. 7. Encourage supervisors to promote safe work practices. 8. Comply with recognized environmental health and safety practices. 9. Explore centralized database for tracking training for all employees. 4 Safety Director Responsibility Responsible for the administration of all phases of the applicable safety programs and for providing technical assistance and direction to personnel and departments regarding attaining and maintaining compliance with safety regulations and standards. Develops, administers and interprets programs and policies for industrial hygiene, radiation safety, biological safety, fire safety, general safety and chemical safety. Communicates with federal, state, and local regulatory agencies concerning compliance and emerging standards. Plans, organizes and directs department work activities. Performs related duties as required. Assist other Safety & Risk Management personnel in their respective programs. Specific responsibilities include: 1. Analyze the reported Worker Compensation data to determine weaknesses which could lead to injury or loss. Job Hazard Analysis is a valuable tool to use in this process. 2. 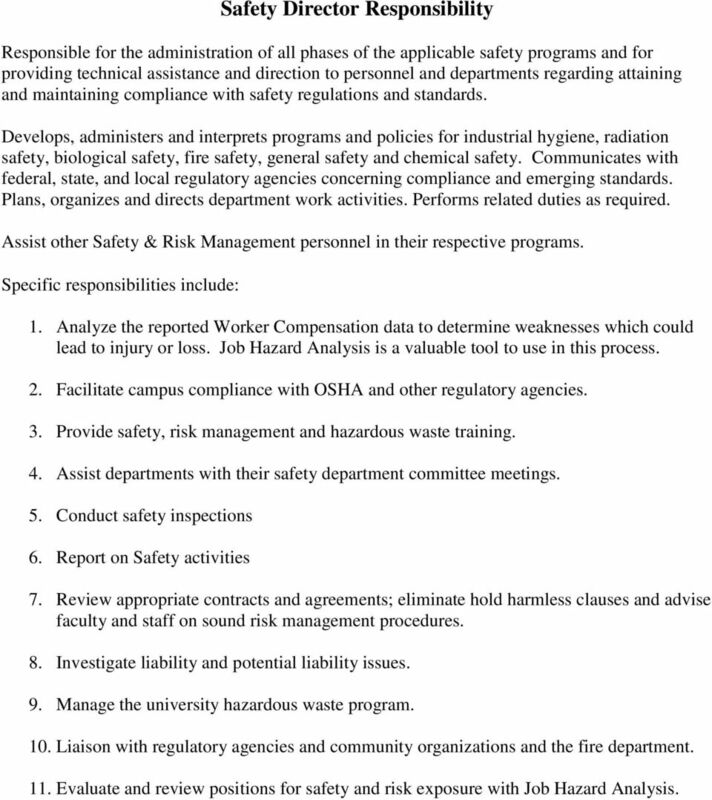 Facilitate campus compliance with OSHA and other regulatory agencies. 3. Provide safety, risk management and hazardous waste training. 4. Assist departments with their safety department committee meetings. 5. Conduct safety inspections 6. Report on Safety activities 7. Review appropriate contracts and agreements; eliminate hold harmless clauses and advise faculty and staff on sound risk management procedures. 8. Investigate liability and potential liability issues. 9. Manage the university hazardous waste program. 10. Liaison with regulatory agencies and community organizations and the fire department. 11. Evaluate and review positions for safety and risk exposure with Job Hazard Analysis. 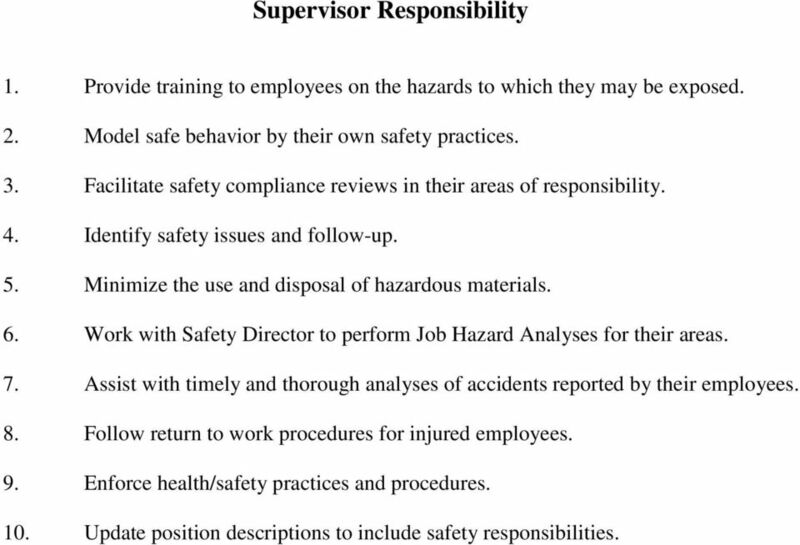 5 Supervisor Responsibility 1. Provide training to employees on the hazards to which they may be exposed. 2. Model safe behavior by their own safety practices. 3. Facilitate safety compliance reviews in their areas of responsibility. 4. Identify safety issues and follow-up. 5. Minimize the use and disposal of hazardous materials. 6. Work with Safety Director to perform Job Hazard Analyses for their areas. 7. Assist with timely and thorough analyses of accidents reported by their employees. 8. Follow return to work procedures for injured employees. 9. 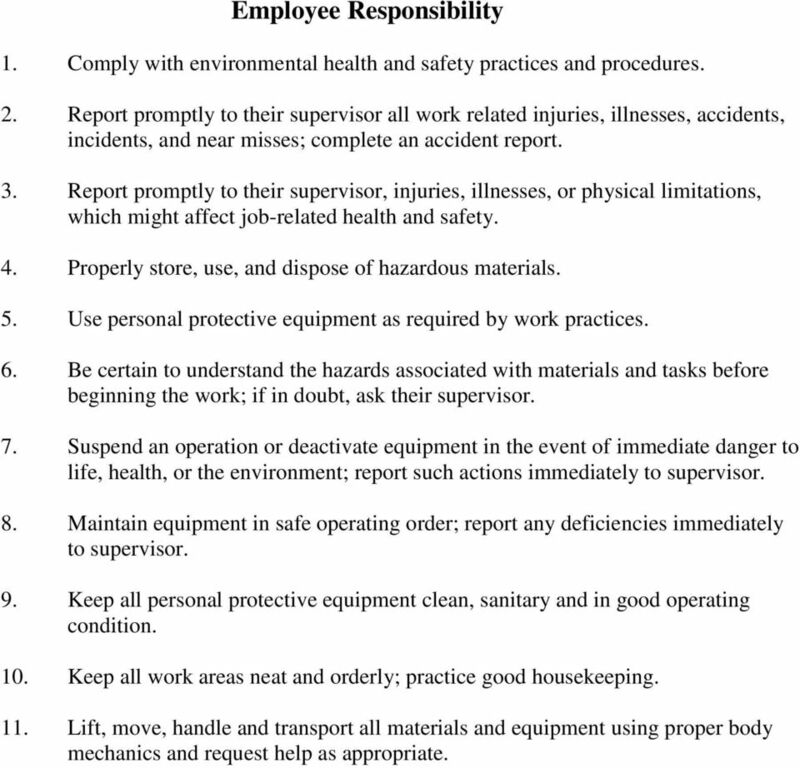 Enforce health/safety practices and procedures. 10. Update position descriptions to include safety responsibilities. 6 Employee Responsibility 1. Comply with environmental health and safety practices and procedures. 2. Report promptly to their supervisor all work related injuries, illnesses, accidents, incidents, and near misses; complete an accident report. 3. Report promptly to their supervisor, injuries, illnesses, or physical limitations, which might affect job-related health and safety. 4. Properly store, use, and dispose of hazardous materials. 5. Use personal protective equipment as required by work practices. 6. Be certain to understand the hazards associated with materials and tasks before beginning the work; if in doubt, ask their supervisor. 7. Suspend an operation or deactivate equipment in the event of immediate danger to life, health, or the environment; report such actions immediately to supervisor. 8. Maintain equipment in safe operating order; report any deficiencies immediately to supervisor. 9. Keep all personal protective equipment clean, sanitary and in good operating condition. 10. Keep all work areas neat and orderly; practice good housekeeping. 11. Lift, move, handle and transport all materials and equipment using proper body mechanics and request help as appropriate. 7 Occupational Safety and Health Action Plan Objectives Recruit and fill the vacant environmental specialist position in Safety & Risk Management. This position will be focused on occupational safety training as its main duty. Continue to strengthen our safety training program by offering more online training modules, including modules with quizzes. Integrate the safety training program with the new PPE hazard assessments by starting a training database that is shared with service departments by posting on the Stout Bluedrive. Continue to offer CPR training. 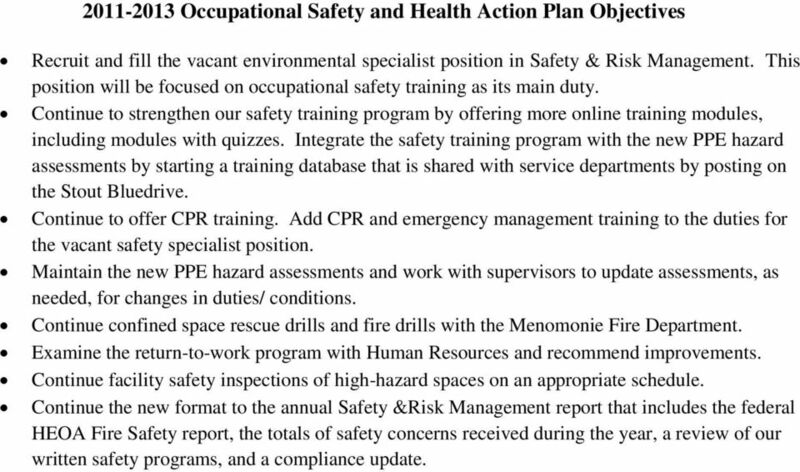 Add CPR and emergency management training to the duties for the vacant safety specialist position. Maintain the new PPE hazard assessments and work with supervisors to update assessments, as needed, for changes in duties/ conditions. Continue confined space rescue drills and fire drills with the Menomonie Fire Department. Examine the return-to-work program with Human Resources and recommend improvements. Continue facility safety inspections of high-hazard spaces on an appropriate schedule. Continue the new format to the annual Safety &Risk Management report that includes the federal HEOA Fire Safety report, the totals of safety concerns received during the year, a review of our written safety programs, and a compliance update. 2. Assure compliance with federal, state, and local regulations providing for environmental health and occupational safety. Office of Research Facilities Development and Operations Contractor Safety Policy The National Institutes of Health (NIH) is committed to providing a safe environment for everyone who enters the NIH campus. This program is listed as a mandatory inspection item on the MnOSHA Investigation Checklist, Item 7D. MAY 18 20, 2010 SAFETY TRAINING CALL (843) or to sign-up for courses. Introduction In today s highly competitive industry, the advancement of technology and processes has brought about an increased concern for environmental, health and safety issues facing the business community.